My favorite "must eat" spot in Toronto--the sausage and cheese fries truck beside Eaton Centre and City Hall. I am not ashamed and you shouldn't be either. What could be better on a delightfully partly cloudy spring day, than a jumbo hotdog brimming with peppers, kraut, mustard and other agents of heartburn, with a side of poutine. 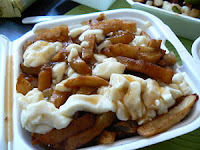 If you've never had this tasty, sodium-rich Canadian specialty, I'm telling you now it will change your life forever. French fries topped with cheese curds (mmmm, squeaky!) and brown salty gravy. And if the fries and gravy are just hot enough, they'll make the cheese curds warm and squishy (in a good way), yet not quite melty, and oh so perfect. What more could you want in life besides poutine? That's right, beer. My other favorite place to eat in Toronto is Beer Bistro on King St. I recommend grabbing a seat on the bar side of the restaurant where they have cozy couches and seating against the plate glass windows that look out onto the street making it a great spot for people watching. Try the "corn dogs" filled with duck confit (melts in your mouth) and the pulled pork sandwich, or Kobe beef tacos. The Belgian frites are good too, everything with homemade condiments. See how many times you can say "a party in my mouth" throughout the evening. But we were talking about beer, and they have an impressive draft selection, and a much larger list of bottles. The staff is knowledgeable, friendly and happy to recommend things--always a good sign to see the same bartender two years later. After having the Blanche de Chambly and Denison's Weissbier I am no longer afraid of Canadian breweries. Party in my mouth. After beer, we move on to chocolate, the last of the three food groups I will discuss. There is a place so magical in the Distillery District that sometimes I think it exists only for me. This place is called SOMA (turns out other people have access to SOMA too, just so happens that they're less worthy.) This boutique chocolate shop roasts their own cocoa beans and turns them into piles and piles of neatly packaged confections right before your eyes. Sit down with a cup of Mayan drinking chocolate and watch them pour perfectly tempered chocolate into molds, over and over again. (To the woman making the fabulous chocolate at SOMA--I didn't mean to make you nervous--I stare like that at all the pretty confectioners.) Try the cashews tumbled in milk chocolate or the inclusion bars (ginger and orange are particularly good). Absolutely do not leave without buying the English toffee, which is covered in Peruvian dark chocolate and crushed almonds. Oh right, and they have truffles too.